"15 years is a long time and in the beginning we had no idea that we would see Catherine achieve so much or endure so much. Helping just felt like the right thing to do when we saw how the first Imprezza School in Nairobi struggled and fought just to remain open. I’ll never forget the assembly when Chris gave the girls a graphic and fairly horrific picture of the toilets at Imprezza. He had taken photos while he was there. That certainly stirred some consciences. Here in Torquay we were in the middle of lots of major improvements – new classrooms, labs, dining room, language rooms. We were getting rid of old worn out buildings while Catherine had virtually nothing. The girls were brilliant and really took Imprezza School to their hearts and it is fantastic that after 15 years they still do so much. Having Catherine visit the school was always very special because I don’t know anyone who has ever met her and not been inspired by her vision and commitment to the young people she serves. Over 15 years some people move on and others join which is natural in any charity but maintaining that continuity of commitment is a great achievement and for endless determination in the face of all sorts of challenges we should acknowledge Imprezza’s huge debt to Chris Hulme and his long suffering family. Much has changed in the world and in Kenya in the last 15 years. We are seeing the role of women in society become much more significant, girls’ education now a major international issue, new technology shrinking distance and transforming communication. The thing that has not really changed is the gap between our experiences and expectations here in Devon and that of Catherine’s students in Busia. But there is always hope that in the next 5, 10, 15 years it will be different. Meanwhile I know that it is very important to Catherine to know that her students’ futures matter to us and that she has faithful friends in distant places." You can read more about this evening in our newsletter here. School founder and director, Catherine Omanyo, has been nominated and selected by The International Advisory Board Of The Mandela Legacy Centre For Leadership And Development to receive the highly distinguished African Peace And Development Award for her outstanding leadership and efforts to promote enduring development in Africa. This is a phenomenal achievement and well deserved recognition of Catherine's unwavering commitment to Imprezza School, it's students and, indeed, education throughout Kenya and Africa. She will officially be presented the award during the closing dinner of the 'Africa Policy And Development Summit' on 27th and 28th September 2018 in Kigali, Rwanda. Development Summit on 27th and 28th September 2018 in Kigali Rwanda. A wonderful effort from Tom and James in the Geneva marathon who have raised over £2,000 towards Imprezza's much-needed sports field. "Just over 9hrs combined, so no world records... but we´ll take it nonetheless! We´ll leave the world records to future Imprezza students!!" Well, Tom, you may not be record holders, but you're certainly heroes! Thank you so much! Tom Maclure and James Tolputt are running the Geneva Marathon on May 6th to help raise funds for a new sports field for Imprezza Academy. The school is under pressure to acquire a sports field in order to secure official status and at least qualify for possible support from the local education authority, thus meeting new Kenyan government requirements. A suitable plot of land has been identified - now we need to raise the funds to purchase it! This is an expensive project but James and Tom are enormously passionate about supporting sporting opportunities. If you would like to help ImprezzaAcademy and to support James and Tom, please donate to their Virgin Money Giving page. Here is Tom talking about the Team story..
James and myself have been great friends for over 30 years. We decided that as we will both have reached our 50th by the end of May, we should celebrate with our first joint marathon... crazy fools! We have made a habit of finding sporting challenges since bunjee-jumping in New Zealand in our 20s, rafting the Nile in our 30s and sky-diving in our 40s and the bug gets ever stronger! As we are both passionate about supporting sporting opportunities for boys and girls, we believe that this is an especially worthy cause (not to mention it's high time that others now benefitted from our foolishness)! It will undoubtedly bring huge joy to and provide new outlets for the students, whilst overcoming a pressing requirement for the academy's future security. The total financial requirement to fully purchase the plot identified is a bit higher, but we know we would truly kick-start the process right away with our target sum. We anticipate having to resort to more 'surprises' down the line but this project will be a great motivator! If you feel able to support us, we thank you immensely for that! Pictured below: Catherine delivering an assembly at Torquay Girls' Grammar School and with head teacher Dr Nick Smith. As you may already be aware from our newsletter, there is currently a drought and famine in Kenya which is the worst in living memory, according to Catherine (founder and Director of Imprezza Academy). The school is located in a semi arid area, so long dry spells are not unusual, however this is severe. There is no mains water anywhere in the area including the main town, there hasn't been for a while. The school is drawing from a shrinking river, carrying the water approximately 3/4 mile uphill where it is filtered to make it drinkable. We are sending £150 over this week (March 27th 2017) to purchase more filters, not a cost we had planned for. Criminal gangs have stolen all our vegetables, not only ours but many other growers in the District. This means we have gone from being self sufficient in veg for most of the year to having to buy everything we need. Another unplanned cost. Another consequence of having all the veg stolen is the cost of replacing all the seed, seedlings etc. to start growing again at around £150. Normally some seed is retained for planting for the next crop. We will not have our own veg for at least six months, that is assuming the rains arrive so we can plant. There is another 3.5 acres of land we can bring into food production which would be closer to the school (and our security guards) although this would need to be fenced and fertilised at a cost of £1,000 minimum. This land was planned to be reclaimed slowly using our own compost to build up fertility, but if we want it to come into production straight away that is the cost. We continue to feed nutritious food at the school, but all food costs have rocketed with maize more than doubling in price in a month. This has meant we have had to reduce the amount of meals per day we supply to everyone. A heartbreaking decision, but vital to allow us to survive. All our manual workers are paid well and are able to afford food, but many in the area do not receive good wages with lots still on $1 per day or even less. In reality this means they are working almost 2 days to buy a bag of maize, we are fortunate that none of our people are in that position. Already many in the area only eat every other day so it is inevitable that starvation will take hold as they can't afford to purchase food. And in addition those who can't afford to filter water, typhoid and cholera is a real threat. The rains weather forecast for Western Kenya looked not bad, with rainfall just below average for the long rains period, starting last week (mid-March 2017) and continuing as usual until early June. For the rest of Kenya the forecast is dire with significantly less rainfall than normal, so rocketing food prices will be here for a year if this happens. April is supposed to be the wettest month, but so far the school has seen storms and little rain. Whatever decision we take on planting new crops in the spare land available, we can't do anything without significant rain. "Conservation agriculture has become part of normal practice. It is the easiest as no deep digging. It also saves time and money. We dig holes, if necessary, depending on the crop and after a crop is harvested maize or bean plants/husks are left to cover the land, this conserves soil moisture and increases the grounds fertility. We are seeing crop yields increase year on year. Conservation agriculture methods have been introduced to many in the area and now all our neighbours use conservation agriculture methods. When we started we had to plant crops according to season but with conservation agriculture we don't fear droughts as much as we used to, we prepare the land and plant. Even with this years very bad drought our crops had not failed. This is why they were targeted by the thieves. We have many students to feed, however we have been able to cut food costs (until the theft of our vegetables) by having huge harvests 3 times per year, August, December and April. As you may well be aware, Operation Imprezza ran a crowdfunding campaign in November 2016 to raise £10,000. This money was being raised to build and equip new girls' dormitories so that more students could stay overnight at the academy and avoid the dangerous daily journey. Although we were not able to raise the full £10k, we were thrilled with the generous donations from our supporters totalling £6,467.16 which included a staggering £5k donation from Torquay Girls' Grammar School raised in a sponsored walk by the pupils. This £5000 enabled us to build a semi-permanent girls' dormitory to house 50 students shown in the pictures below. This building will be upgraded to a permanent structure at a later date when we can raise sufficient funds. The remaining £1500 has been used to equip the dormitory with beds and mattresses, and further donations made after the crowdfunding campaign have been spent replacing old and worn out mosquito nets in the existing dormitories. 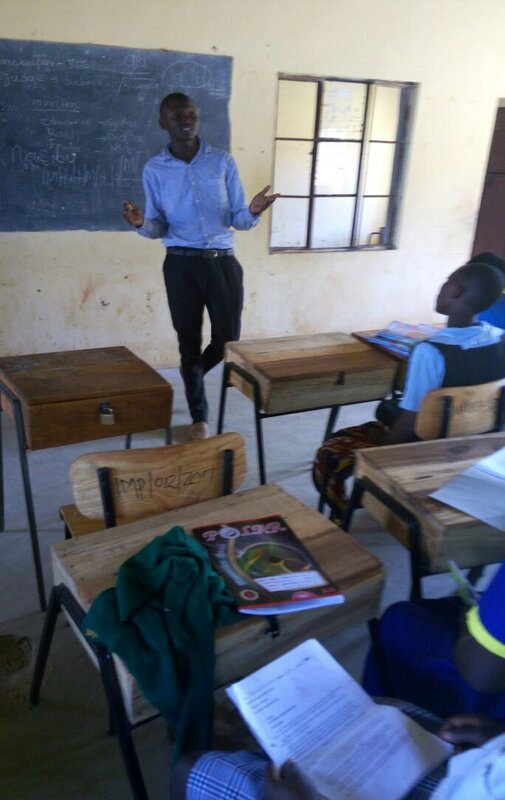 One of our fantastic students, Michael who achieved A's in his exams, is shown here volunteer teaching Chemistry & Biology to forms 1 & 2 at Imprezza Academy. He is waiting to start university in September 2017 and wants to become a dentist. He wished to give back to the community and to Imprezza as thanks for being sponsored through secondary education. 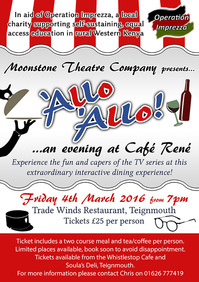 Moonstone Theatre Company brought Café René to the Trade Winds Restaurant in Teignmouth on 4th March, tickets sold out days earlier and a good crowd enjoyed the food and the entertainment which were both superb. Everyone had a great time and the evening raised £758, helped by the raffle and some generous donations. Thanks go to everyone who took part and worked to make it such a success. Special thanks are due, of course, to all at Moonstone Theatre Company and to Nick and his team at Trade Winds Restaurant. Will we do it again? Yes! Watch this space for events in the Autumn'16 and early Spring '17. We look forward to seeing you there! Once again exam results have been amazing, with students achieving high marks despite their incredibly tough circumstances. All students take at least seven subjects and the final grade is an average across the subjects, which makes it very challenging. The results (equivalent to UK A levels) range from B+ to D- with only 5 students in total below C- (which is still a superb grade!). Both boys and girls achieved equally high marks, although on average the girls did slightly better than the boys. Science and Maths were the subjects achieving the best results so far at Imprezza, with English Language being the weaker subject. Head Mistress and Imprezza Academy founder Catherine Omanyo is keen to encourage a novel reading culture at the school to help students with this subject, which will be one of our future goals starting with the construction of a Library. Considering the conditions students endure, especially those not boarding, it is a truly humbling set of results. The consistent good results means Imprezza is attracting more and more fee-paying students, which can only mean bigger and better things for the school. Tremendous congratulations and 'well done!' to our Imprezza Academy students and teachers, and a huge thanks to all who have donated and supported Operation Imprezza over the years to make this all possible. A huge congratulations to our students who participated in a choir that have made it to the national finals! The theme was to tackle the issues of AIDS and Stop Female Genital Mutilation, brave subjects to tackle. Well Done Imprezza Academy Students! A HUGE well done to students at the academy who recently took their exams - of the 25 pupils who took their National exams 21 have passed, and one of our girls achieved a B+ which means she has been offered a place at university and will get state funding. A phenomenal achievement. Well done! 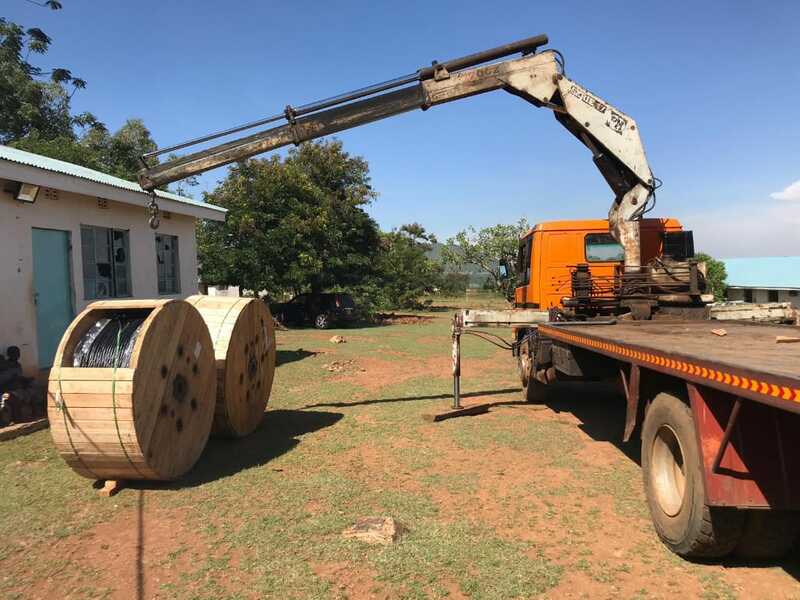 A huge thanks to everyone who made a donation to get our school fence finished - below you can see photos of the work in progress, as well as other building work on the dormitories and food production. We're very excited to finally have rabbits and secure hutches that will be bred for food. They not only eat waste greenery produced from the farm plots but also breed quickly and are relatively easy to keep. Below - the latest agriculture report sent over from Kenya shows the fantastic progress made in growing crops at the school site - this is very promising news both for the school's self-sufficiency programme and for the local farmers involved. The photos below show construction at the site; the ground is hard and stony, the soil is full of roots and hard to dig through and the conditions very hot to work in! Construction of the staff toilets shown below to be completed soon. Electric light is now at the site! Catherine and the trustees would like to say a huge thank you to Dawlish Water Rotary club for their support in helping us to get mains lighting to the site. Such a simple thing we all take for granted here in the UK will have a huge impact on the Imprezza staff and students, making the site safer and life easier as studying can continue into the evening.